NATS, the UK’s leading provider of air traffic services and solutions, has won the contract to provide services to London Luton Airport. The deal, which will see NATS continue to provide tower and engineering services, is for three years. The contract was won following an open market tender process. 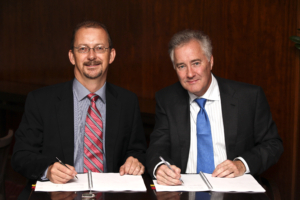 Richard Deakin, NATS CEO and Glyn Jones, Managing Director of London Luton Airport sign the contract. In 2011, London Luton Airport carried 9.5 million passengers with NATS controllers handling 99,296 flights making it the fifth busiest airport in the UK. The contract award means NATS will continue to provide air traffic management services to all five major London airports. It also maintains the London Terminal Manoeuvring Area, one of the most complex and busiest areas of airspace in the world. As well as handling 2.2 million flights a year and providing services to 15 UK airports, NATS also works in 28 countries around the world, with staff based in the USA, Spain, the Middle East, and Hong Kong.